The weather was great. The kids were energized, and the activities were planned. It was time for Camp CPals. This year was the 2nd annual event that included about 16 families. 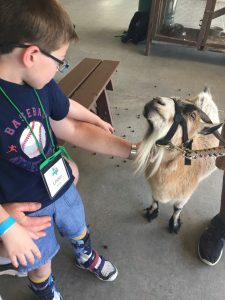 If you’re not familiar with CPATH; it’s a non-profit organization that helps families and individuals with Cerebral Palsy access resources, support and financial assistance. 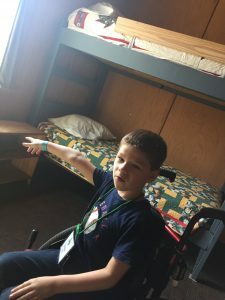 They have made sure Camp CPals has no limitations and that all are included. With that said, each family has a member living with Cerebral Palsy. It was an emotional weekend to say the least. Challenges were faced head on and each child overcame fears that they never thought they could. We arrived at Camp for All on Friday, May 12, ready to have a weekend with zero judgement and barriers. We were assigned to a great cabin with two bedrooms and our own bath. It was way more space than we needed but we were very grateful. After we got everything unpacked we headed to the the pickup spot for horseback riding. 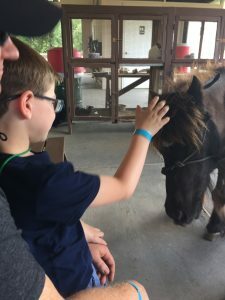 It was just a short ride to the barn where the therapeutic horses were waiting. In our group were 4 other families. Most of the kiddos were around Linden’s age which was perfect. After all the kids were saddled up they were off on the trail ride. I loved watching Linden show his skills. 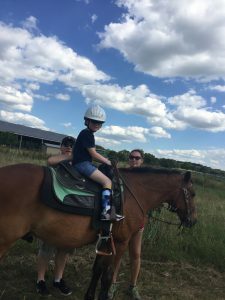 He’s been riding since he was 18 months old so he’s pretty comfortable on horses. 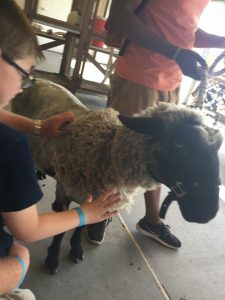 His guide led them through a winding trail in the near by field then it was back to the stables for their petting zoo. They had all sorts of animals; llama, goat, sheet, miniature horse, donkey, pig and a cow. One by one they came out to greet us and let us pet them. It was a treat to have such a small group have special time with these animals we wouldn’t of otherwise of gotten. After, we were on our way to meet up with the rest of Camp CPals group for a quick meet and greet and “energizers” (camp staff led songs and dancing). Linden was all about the energizer. He loves to dance so this was right up his alley. Once we got our wiggles out and felt more comfortable with everyone, it was time for dinner. It was your typical camp food. I will say Linden did eat so I was pretty proud of him. Take note that as that was probably the only full meal he even ate the entire weekend. We had a chance to talk to other parents during dinner which was nice. We all had a common topic, our CP kids. We don’t get to just relax and relate like that everyday so it was extremely nice to meet them all. Once our tummies were full we headed to the campfire and s’mores. More dancing took place and Linden found his crush, Hallie. She is a little older than him and the perfect friend to all children of abilities. It warmed my heart to see her interact with Linden. After all the afternoon and evening activities, it was time for bed. We headed back to our cabin for showers. The beds are your traditional camp layout. There were twin beds in singles or bunk beds. I opted for the single bed and daddy and Linden shared a bunk bed. It took a bit for us to settle in but as soon as our heads hit those pillows, we were out! We woke early on Saturday, ready to see what the day had in store for us. Linden was so excited he was trying to head out the door before we had our day bag packed. We ate breakfast and had our camp hosted energizers then we were headed with our group to the “Giant Swing”. I couldn’t wait to see what this was all about. Linden wasn’t as thrilled. Kids were put in harnesses from top to bottom. They were then buckled in to a harness line that dangled 10 feet above the ground. From there the line went as high as 75 feet. Linden refused to go. After all the kids went up and were swung back and forth he built up the courage to go for it. I was a nervous momma but the staff were very qualified and ensured every child’s safety. 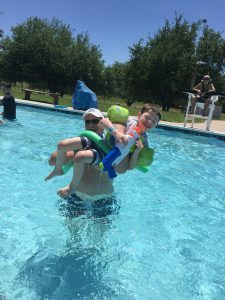 Linden went up and was unsure at first but as soon as they let him go he was OFF….he loved it! Video included, click here. He was smiling from ear to ear and laughing. He loved it so much he went 4 more times. I was so proud of him for conquering his fears. After all the excitement it was time for archery and small animals. Linden was not in the mood for the animals so we skipped over to the archery range. 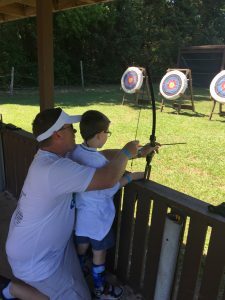 It was a bit tricky for our kiddos but with some adapted bows and extra equipment our kids became pros in no time. Linden didn’t hit the target but that’s okay because he tried something new and I couldn’t be more proud of him. Once our group got their fill of bow and arrows we were off to lunch. The kids were tired and the sun was starting to wind them down. This meal was yet another one that Linden ate very little of. He was cranky and needed some down time. We headed to the cabin to get in our swim suits but found ourselves laying down for 30 minutes. I think it helped Linden. Once we gained our energy we were off to the swimming pool. It was a great accessible pool. It had several swallow areas and a gradual slope that made easing in tolerable for some. Once daddy and Linden were set in the pool, I was swished off to my mommy massage. I was given a fantastic 15 minute massage with no interruptions, no one screaming that they needed anything and no one in my face. To say it was nice would be a understatement. It was AMAZING! After pool time were the children activities and respite for the adults. It was awesome! Linden was paired up with a fantastic gentleman that took to him so easily. It really put us at ease. 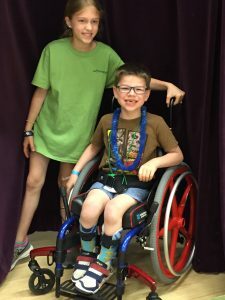 Linden and his buddy were off on a scavenger hunt and a superhero party. Us adults were kind of beside ourselves. We were given 3 hours of “us” time. It was so nice. The camp staff hosted a indoor ropes course and zip lining activity. We had no one to look after and it was amazing! Before the ropes course we played a game called Cookie Face. It’s like minute to win it and William volunteered. It was hilarious. Click here to see the video. I couldn’t help myself. 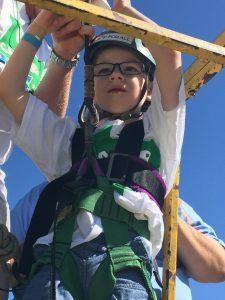 I also included a video of William zip lining, click here. He had a blast. After our adult time, we went to pick up our kiddos. You could see the exhaustion on their faces. They were spent! Linden was dressed as a super cute superhero and was holding a new souvenir, a pet rock. I’m assuming he found it along his way during the scavenger hunt. Either way it was his and he was keeping it. Dinner was served which was again okay but we gobbled it up. Being active and in the sun all day made us have enormous appetites. Our energy levels were drained but the camp staff had one more activity planned. They set up carnival games in which the kids won tickets for prizes. Linden did really well and had a blast but our fun was short lived as he was beyond tired and done for the day. We got him a snow cone before heading back to our cabin for the night. All in all this was a weekend of pure emotions. He overcame more in these three days than most kids do in a year or even lifetime. I am so proud of my kiddo for stepping out and braving the challenges put in front of him. I’m also proud to call these families our new friends. 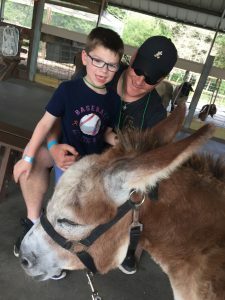 Camp CPals was amazing and CPATH is even more amazing for making this possible for my son. 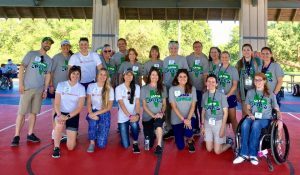 Thank you to CPATH, Camp for All and all the wonderful volunteers. Wow that’s amazing he was able to do everything and wasn’t frightened! Better than his Nina! What a wonderful place with wonderful people!